Priority issues were first identified through the focus group discussions, with participants then asked to rank them in order from most important (No.1) to least important. All groups consistently ranked six issues as high priority; water, rubbish, customs & traditions, health, uncontrolled animals and natural resources. 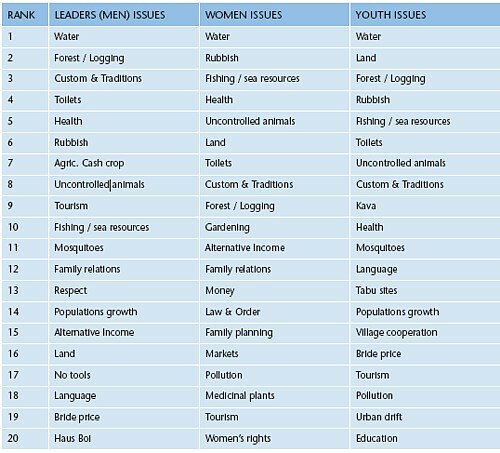 However women identified more strongly with health, family and economic issues, and the youth population with land issues (Table 1). Participants were asked to record their perceptions of the influence or decision making power that a particular group or individual has on a specified issue from not very influential (#1) to highly influential (#5). Issues selected were those previously identified as high priority and hence were different between individual communities and groups: e.g. 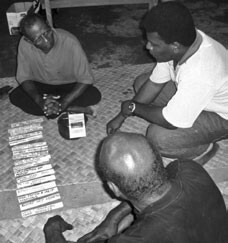 leaders, women and youth may have focused on different issues. The variation in literacy levels between groups and communities may have influenced the findings (see Appendix 1 for constraints and limitations). community members, landowners and chiefs consistently featured as influential decision-makers. 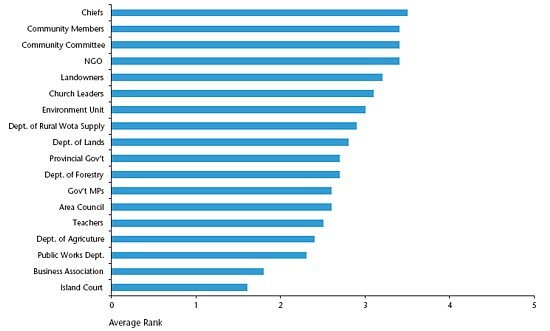 Individual Government Departments predictably featured closely related to issues around their core business. 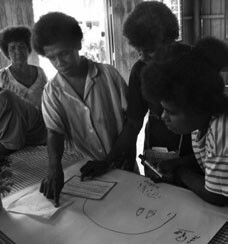 Chiefs, Community Members, Community Committees and NGOs were deemed influential in relation to most issues (Figure 4). 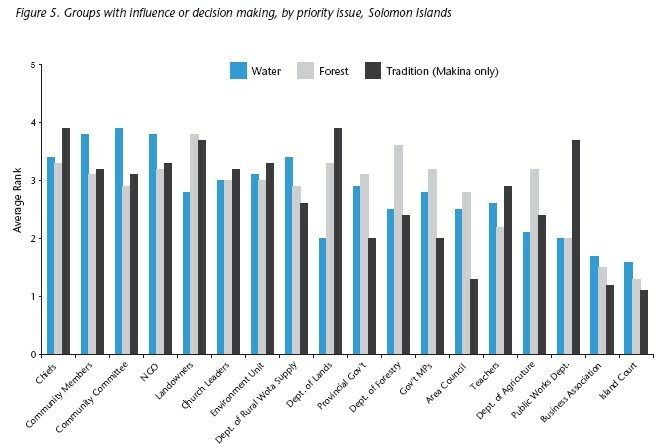 The perceived level of influence was relatively consistent across each of the priority issues for the two participating communities (Figure 5) although some variation was elucidated through discussions, as outlined below.